Director Peter Chan (The Warlords, Perhaps Love) reunites with his regular screenwriter Oi Wah Lam for a martial arts film with real acting credentials in Dragon. Set in a quiet rural village in China in 1917, the local papermaker Liu Jin-Xi (Donnie Yen, Blade II, Hero) comes to the attention of regional police investigator Xu Bai-Jiu (Takeshi Kaneshiro, House of Flying Daggers) when Jin-Xi happens to thwart a robbery in the village's general store by two notorious convicted criminals. Suspecting that there is more to the quiet, married father of two Jin-Xi than meets the eye, Bai-Jiu doggedly pursues his investigative instincts revealing a truth that will have far reaching ramifications for both men. 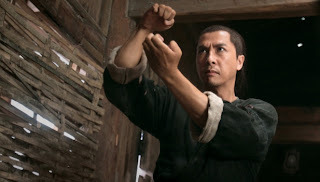 Donnie Yen pulls off the impressive feat of combining a subtle turn as Jin-Xi along with being the fight co-ordinator/choreographer for Dragon. Bai-Jiu's own interest is in the mastery of martial arts and it is this that threatens to expose Jin-Xi and his past while being the point of convergence between these two men. Each action sequence is not staged just for it's own sake, but to seamlessly progress the various narrative threads that make up the fabric of Dragon. Always inventive, the action sequences feel fresh and exciting even to a veteran action film fan. Jin-Xi and Bai-Jiu are men who are aware of their own split personas that threaten to overwhelm their carefully constructed lives. The danger of crossing moral lines is considered throughout the film. When Bai-Jiu crosses such line in his investigation, he catches the attention of the ruthless 72 Demons criminal gang who have been searching for a man with the same skill set as Jin-Xi is attempting to hide. The leader of the gang is simply known as The Master played by martial art film legend Yu Wang. The Master is a genuinely fearsome threatening force who is quite frankly, as tough as a nail. Peter Chan embellishes the intriguing script of Dragon with masterful film slights of hand and stylised effects that bring us into the body and even souls of the characters. The soundtrack is modern which fits well with the 1917 setting of the film that has an Eastern timelessness while having shades of modern Western life impinging around it's edges. Yen's fight choreography is as fluid as that found in Ang Lee's Crouching Tiger, Hidden Dragon though more grounded and less balletic then Crouching Tiger. Ultimately, Dragon could be said to be an Eastern version of David Cronenberg's 2005 A History of Violence. These two films feature strong female roles with Wei Tang as Jin-Xi's wife Ayu being the corner stone of Jin-Xi's story. Both A History of Violence and Dragon are reminiscent of Hollywood Westerns and satisfy on this level as well as not sacrificing story or acting skills in the pursuit of the next big marvellous action sequence. Dragon is out in the UK on the 3rd of May 2013. It was presented at a special screening at the Cannes Film Festival in 2011.